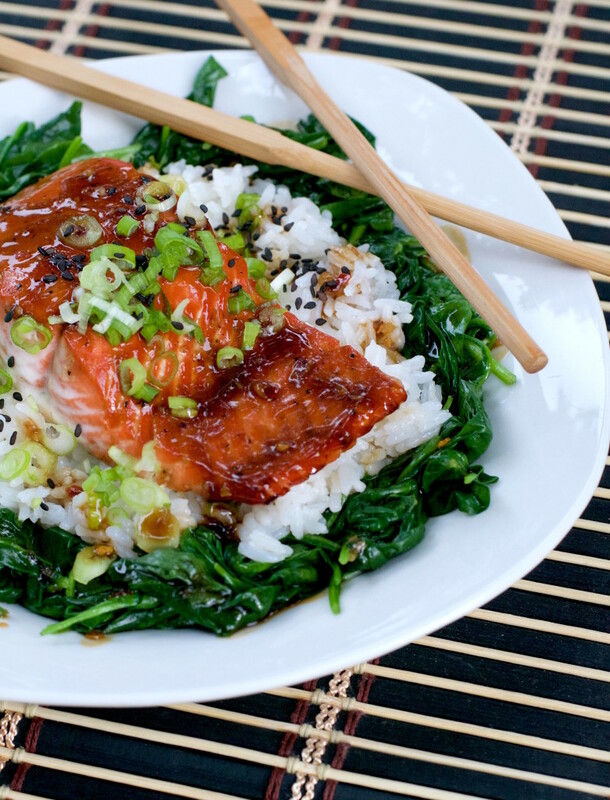 Glazed Salmon Rice Bowl - What the Forks for Dinner? Dinner in a bowl…….what could be better? 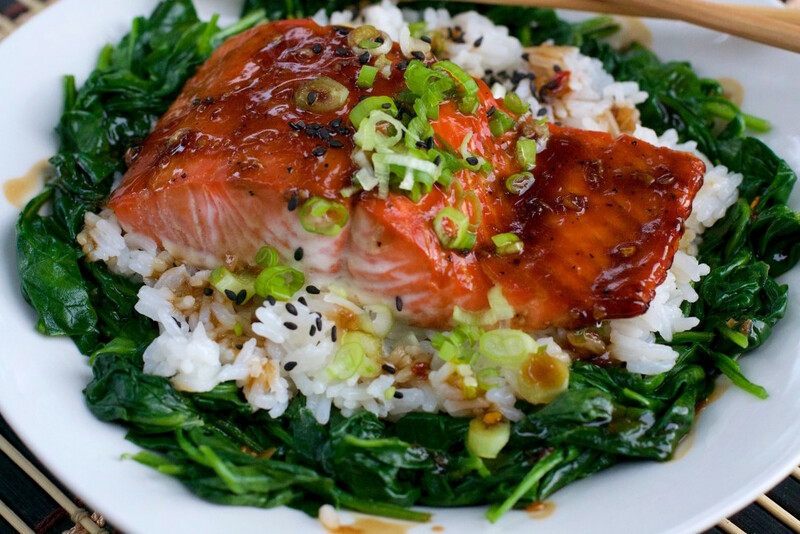 Glazed Salmon Rice Bowl……in a bowl!!! You are a super food! So, I have been on an Asian kick……rice, soy, garlic…….lets make Asian salmon. A nice glaze of soy, lime juice, garlic and red pepper flakes for a touch of heat. But we need something sweet……honey…..not this time…….agave……no, not that either……..how about maple syrup? Real maple syrup….sorry Aunt Jemima and Mrs. Butterworth’s. It was the perfect touch of sweetness. Roast the salmon in a 400* oven with a teaspoon…..or more of the glaze…….perfection. Be sure to line the baking sheet with foil or the perfection of the salmon will become the distain of cleaning the baking sheet. The rest of the dish……bowl……is simple. Sautéed spinach and rice. How easy is that????? I didn’t think that I would use the rice cooker feature on my pressure cooker……great investment by the way! But, I use it all the time……perfect rice in 15 minutes! 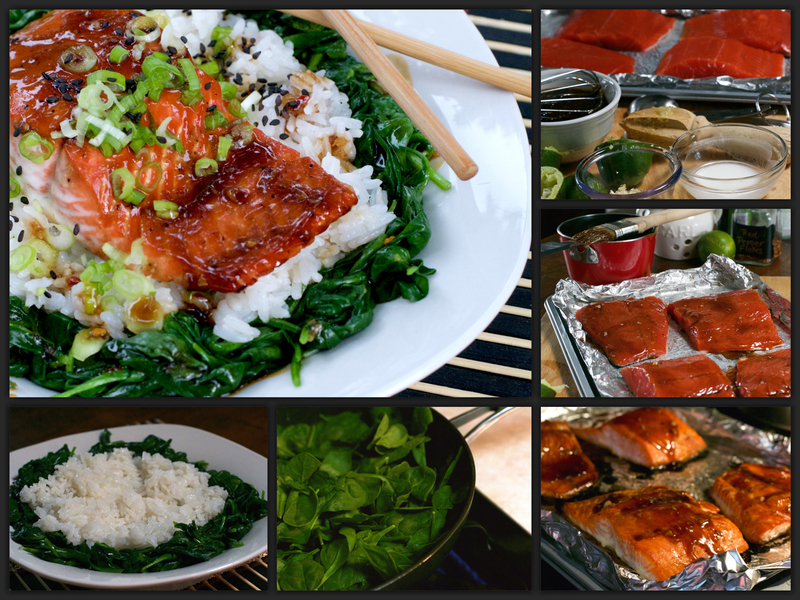 Once the salmon is cooked, it’s a matter of stacking…..spinach, rice, salmon, glaze, green onions, and black sesame seeds………Glazed Salmon Rice Bowl! If you cannot find black sesame seeds do not stress….use regular. I just happened across them a the local famers market…. Twin City Farmers Market. Sterling Gardens had a large variety of organic herbs and spices and while talking with the owners Fred and Charlin Nolan, I spied the black sesame seeds and scooped them post haste! I think they are beautiful and add a touch of elegance to the dish. 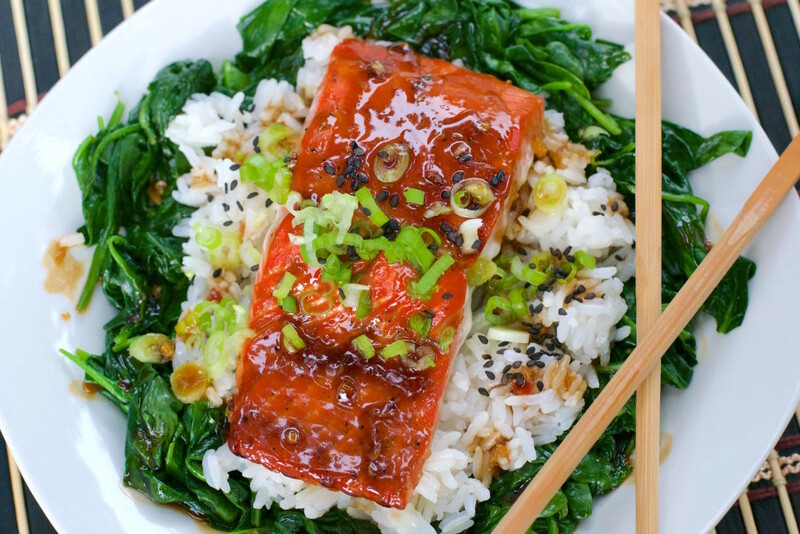 So, bowl your family or friends over …….Glazed Salmon Rice Bowl! Heat oven to 400°F. Cook rice as directed on package. In a small saucepan, melt coconut oil over medium heat. Sauté garlic and pepper flakes until garlic is lightly golden, 1 minute. Add syrup, juice and soy sauce; cook until bubbling, 3 minutes. Stir cornstarch mixture into garlic glaze. Cook until slightly thick, 1 minute. Remove 4 teaspoons of glaze to a small bowl. Place fillets on a foil-lined baking sheet. Spread 1 teaspoon glaze form the small bowl over each fillet. 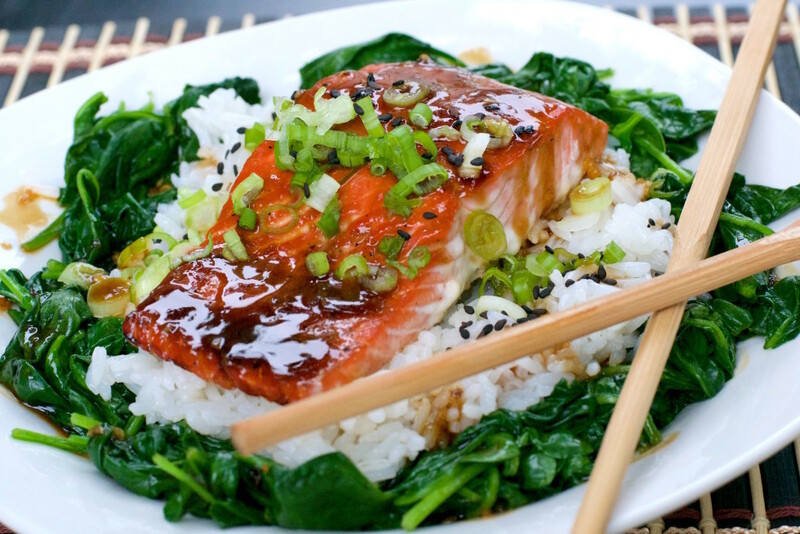 Do not dip into the remaining glaze with a spoon used for the raw salmon. If you need more glaze pour from remaining glaze into the small bowl. You do not want to contaminate the remaining glaze as you will need it later. Roast salmon until just cooked through, 12 minutes. Spray a medium skillet, with non stick cooking spray and heat over medium heat. Add 1/2 spinach; sauté until just wilted. Remove from pan; set aside. Repeat with remaining spinach. 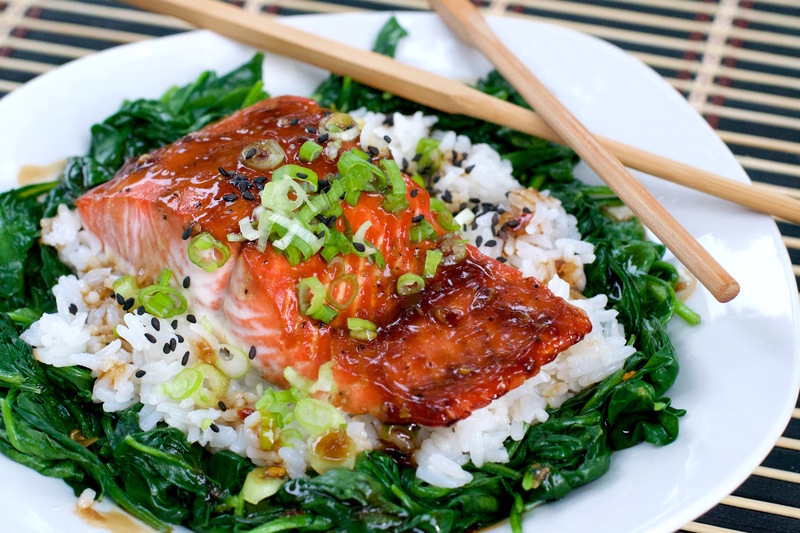 Divide spinach among 4 bowls; top each with 1/4 rice and place salmon fillet, on top of rice. Drizzle with remaining sauce; sprinkle each with green onions and 1/2 teaspoon sesame seeds. This was delicious, the sauce is AMAZING! Thank you for the recipe! Amazing! I’m picky about my salmon and this came out perfect. Thanks, Shannon I’m glad you enjoyed it!